There are a few things that scream “autumn”. Pumpkins, apples, fall foliage, football and Thanksgiving are at the top of my list. A couple several weeks ago, I went apple picking with a group of friends and came home with a big ol’ bag of apples. Apples are notorious for lasting along time (as long as they are not bruised) and I have plans for the other ones I have in my fridge. But for now, I have this recipe for you. 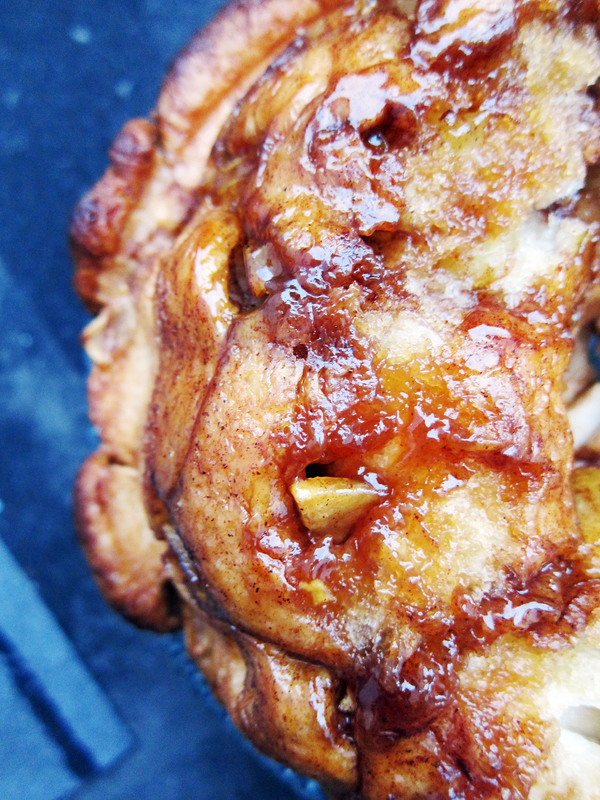 If you’ve never had monkey bread, you’re missing out on some serious yum. If you took cinnamon rolls but made them bite sized and decided to glue them together with some cinnamon sugar, you’ve got monkey bread. 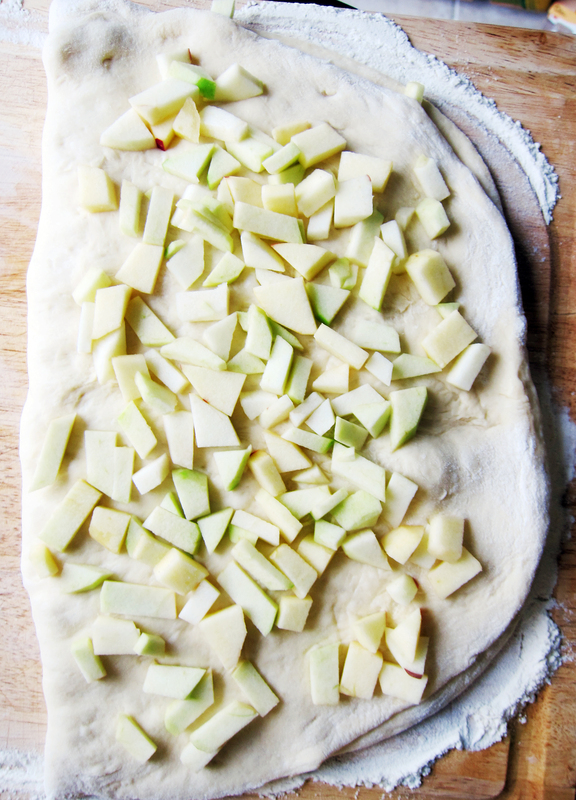 Cut up some fresh apple chunks and stuff them in the sweet dough and you have fall in bread form. I have to be honest. I’ve made and shot this recipe weeks ago and I started writing the first paragraph last week, but things became hectic and that’s as far as I got. But to be fair, I threw a Star Wars Rebels themed party and that kept me quite busy for a several days. I’m excited to share it with you on my next post! Generously spray the inside of a 10 in. Bundt pan with nonstick cooking spray. In a small bowl, warm your milk, add the yeast and whisk to dissolve. (Do not warm it above 110˚F or you will kill the yeast). In the bowl of a standing mixer fitted with the paddle attachment, beat the flour, 5 tbsp. sugar, egg, and salt until combined. Slowly add in the milk mixture until combined. Add the 5 tbsp. melted butter and mix until the dough comes together. Replace the paddle attachment with the dough hook attachment. 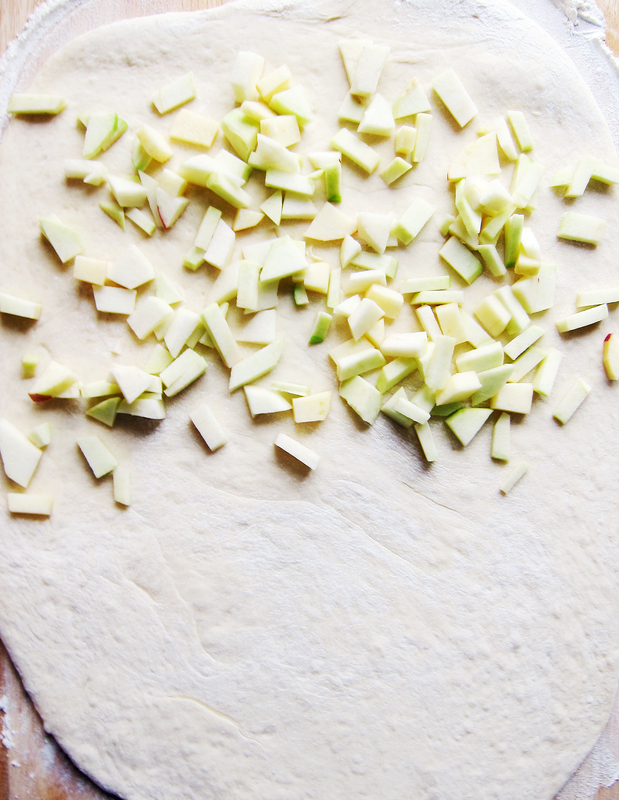 Continue to mix on medium speed until the dough becomes silky and tacky, but not sticky, about 8-10 minutes. Spray a large bowl with cooking spray. Cover the bowl with plastic wrap and let it rest in a warm area until the dough has doubled in size, approximately 1 hour. 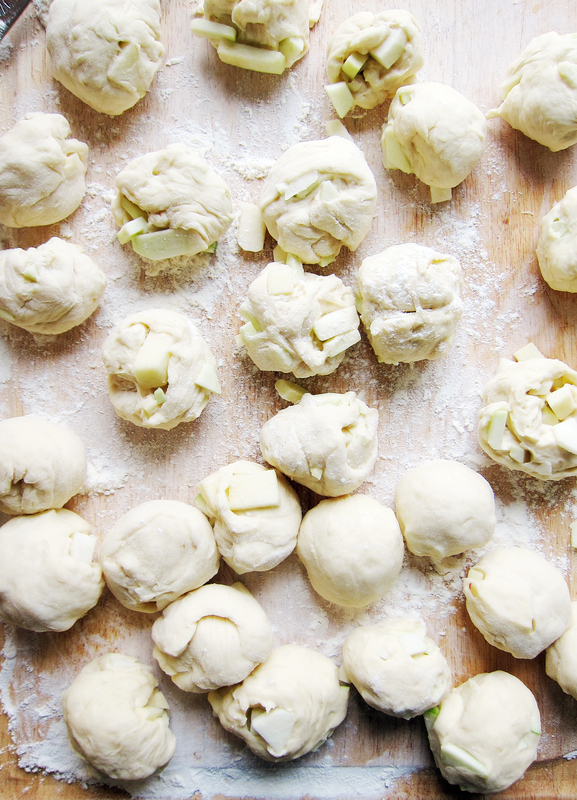 Cut dough into 1 to 1 ½ inch pieces and roll the pieces into balls (apple pieces may stick out). Place the balls on the sheet pan. In a small bowl, stir together the sugar and cinnamon. Place the melted butter in a separate bowl. Dip one dough ball in the melted butter. Let the excess butter drip back into the bowl, roll the ball in the brown sugar mixture, and place it in the Bundt pan. Continue this process with each ball, until halfway where you will scatter the rest of the apple pieces. Wrap the Bundt pan tightly in plastic wrap and let rise in a warm area until the dough balls have doubled in size. Bake until the top layer is deep brown and the caramel coating begins to bubble around the edges, about 30 minutes. Cool the bread for 5 minutes, then turn it out directly onto a platter and serve warm. If you have any leftovers, reheat them in a 300 degree oven until warm to the touch. Recipe adapted from Baked Explorations by Matt Lewis and Renato Poliafito. 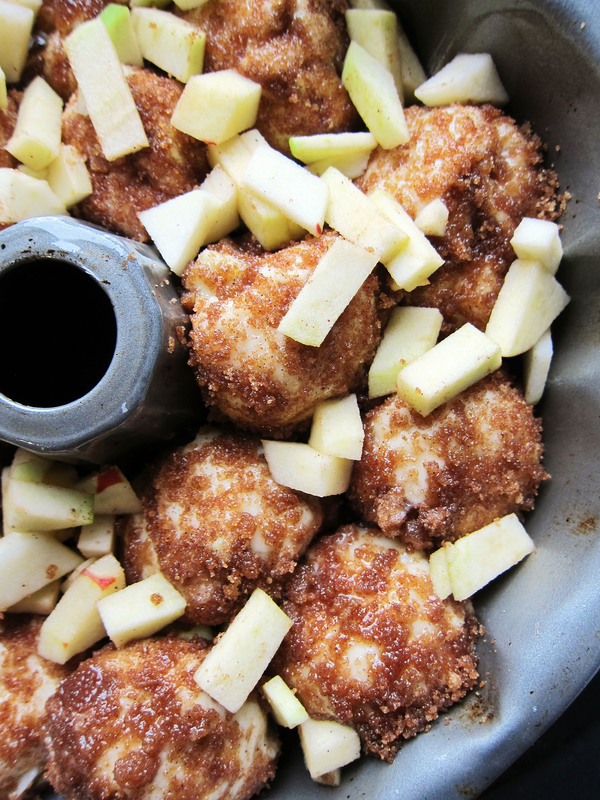 This entry was posted in Apples, Bread, Caramel, cinnamon, Desserts, Fruit and tagged apple, autumn, bread, Caramel, cinnamon, dessert, Desserts, fall, monkey bread. Bookmark the permalink. Can’t wait for that Star Wars post!! 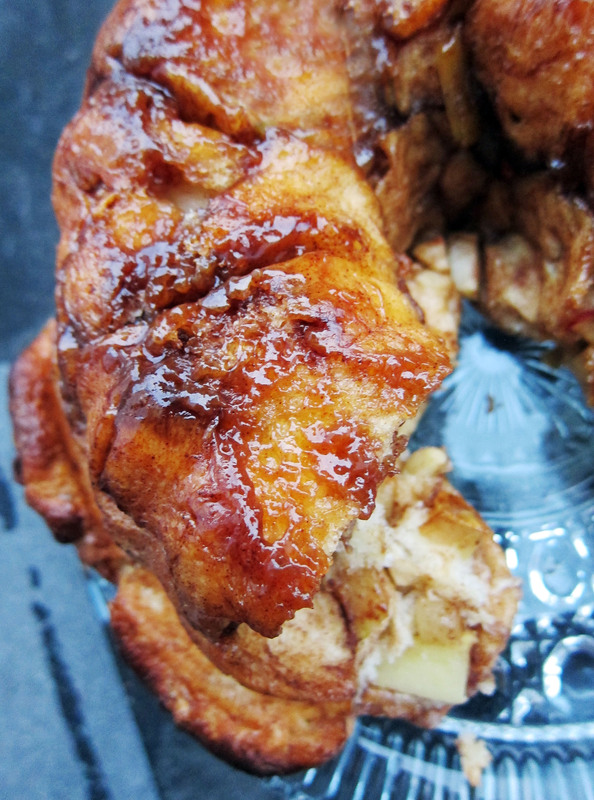 love monkey bread, so much fun to pull apart all the sticky sweet goodness, yours looks delicious, caramel and apple is such a perfect combination – yum! Thank you ❤️ It really is a year round dish!